A bird of high mountains, this species lives all year round in the sparse vegetation and grassland of the Puna Plateau in the Andes. On cold nights it becomes torpid (inactive, maintaining a reduced body temperature) to conserve energy, reviving and becoming active in warm sunlight. 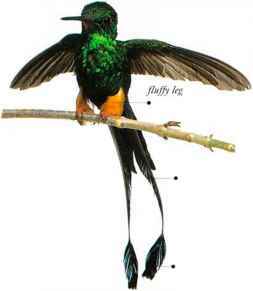 In open, windy places it uses its strong feet to cling to branches instead of hovering to feed. It takes nectar from flowers, also catching insects. Andean Hillstars are unusual for their territorial behavior. 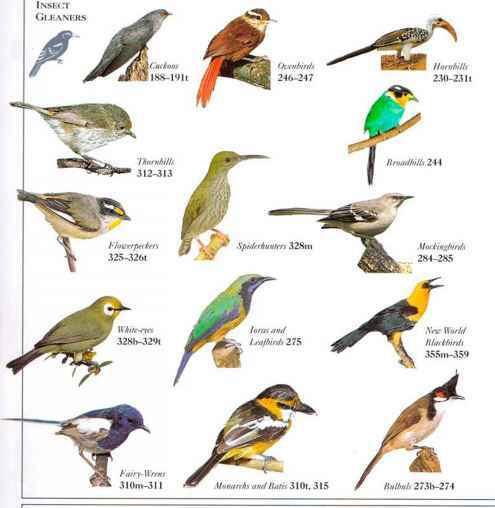 The females hold permanent territories where nesting takes place, and after nesting the males move out and live elsewhere, usually at higher altitude. • NliST A thick-walled cup nest of moss, plant down, and lichens, suspended under a cliff overhang, in a cave, or under house eaves. • Distribution Andes from Peru to Argentina and Chile. \\ hen seen in flight, this dull-colored hummingbird looks more-like a martin or a swift with a long bill. 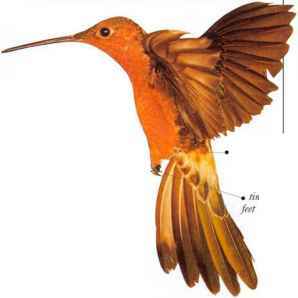 Its wingbeats are slower and more visible than those of other hummingbirds as it hovers, batlike, in front of a flower to take nectar. It often perches to feed. This is an aggressive bird that will chase other species away from its feeding sites. Like other hummingbird species, it also eats small insects. A bird of semi-open scrub in the more arid parts of the Andes, at altitudes where the climate is temperate, it also frequents cultivated areas. 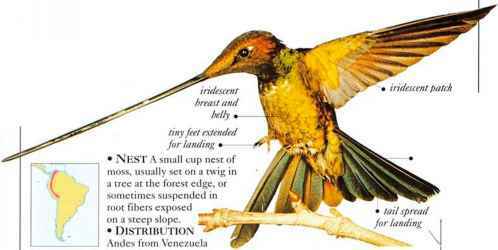 Its size helps it to withstand the low temperatures in the mountains; having less surface area relative to body size than the smaller hummingbirds, it is better able to conserve its body heat. During cold weather it moves down to lower altitudes. • NliST A small cup nest made of moss and lichens, placed on top of a level branch or sometimes on a cactus stem. The nest rappears too small for a bird of this size. DISTRIBUTION with the largest body size.